Vermeiren’s origin goes back to at least 1650. As established local village bakers they made speculoos cookies in addition to daily bread. 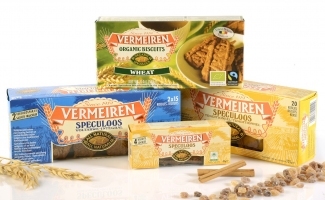 The demand for the speculoos cookies however was such that in 1919 Vermeiren Princeps started to specialize in cookies only under the brand name “Vermeiren Speculoos”. So, what we produce today has a history of over 350 years. The basic recipes still use honest ingredients from all over the world. Carefully mixed and slowly baked into those wonderful speculoos cookies. The whole process takes over 24 hours. Maybe they are the slowest cookies on earth. Could it be, we do something right? Traditional speculoos Cookies. Made from wheat flour. Delicious taste. Small wonder with honest ingredients like brown candy, raw cane sugar from Mauritius and cinnamon from Indonesia. 100% vegetable, no milk, no eggs, no animal fats. Sorry, we can’t give you the full recipe, it still is a family secret. You sleep and dream of te taste of speculoos cookies. You wish you could get that for breakfast or even lunch. Every so often wishes come true. We now have harnessed that taste in jars of 350g. Made from the same honest ingredients, still 100% vegetable and no salt added. A treat for every child, although we know grownups hiding their jars. VERMEIREN PRINCEPS CELEBRATES HER 100 YEARS ANNIVERSARY IN 2019!!! ALREADY FOR 100 YEARS VERMEIREN PRINCEPS BAKES YOUR FAVORITE SPECULOOS BISCUIT THAT TASTES DELICIOUS WITH A CUP OF COFFEE OR TEA! 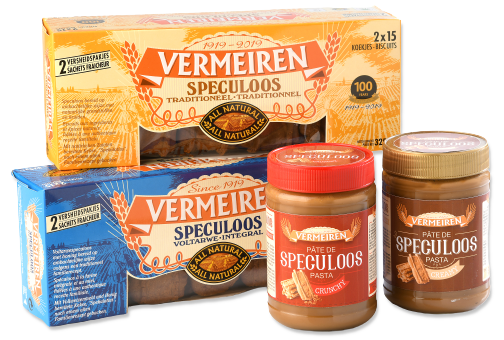 The family 'Vermeiren' bakes their marvelous, artisanal speculoos biscuits since 1919. In 2019 Vermeiren celebrates her 100 years anniversary!